Can You Taste The Color? How does hue alter flavor? Experimental psychologist Charles Spence gives us a tour of our tastebuds. The following is an excerpt from Gastrophysics: The New Science of Eating, by Charles Spence. What we taste is profoundly influenced by what we see. Similarly, our perception of aroma and flavor are also affected by both the hue (i.e., red, yellow, green, etc.) and the intensity, or saturation, of the color of the food and drink we consume. Change the color of wine, for instance, and people’s expectations—and hence their tasting experience—can be radically altered. Sometimes even experts can be fooled into thinking that they can smell the red wine aromas when given a glass of what is actually white wine that has just been colored artificially to give it a dark red appearance! At various points in history, scientists (some of them really rather eminent, like one of the godfathers of psychology, Hermann Ludwig Ferdinand von Helmholtz— anyone with a name that long should probably not be messed with!) have confidently asserted that there is absolutely no association between color and taste. At the other extreme, there are some artists out there today who are inviting the public to “taste the color.” I have to say that I don’t think either side has got it quite right. Colors are very definitely linked with tastes, and yet I do not believe that you can create a taste out of nowhere, simply by showing the appropriate color. Consider the amuse bouche created by the London- based chef Jozef Youssef as part of Kitchen Theory’s “Synaesthesia” dining events, which developed out of the latest research findings from my Crossmodal Research Laboratory. We have spent the last few years researching what tastes people around the world associate with different colors, and looking at the colors that people naturally/spontaneously associate with the four most frequently mentioned basic tastes. The results fed directly into the design of the chef’s dish. Had you been a guest at the restaurant, you would have had four spoons of espherified colorful taste placed randomly down in front of you—one red, one white, one green and one browny-black. Once everyone has their four spoons, they are informed that the chef recommends starting with the salty, then the bitter spoon, next the sour, and ending on a sweet note—leaving you and the other diners a little perturbed as to which order exactly you should taste the spoons in. The idea is that the diners arrange their own spoons from left to right in front of them in the order: salty, bitter, sour and sweet. Having arranged their own spoons, the diners normally start to look around and compare notes with each other. In the restaurant, or online, we get somewhere around 75% of people ordering the spoons in the way that the chef (and the gastrophysicist) intended. So on the basis of such results, I would say that tastes are very definitely associated with specific colors. Color can be used to modify people’s perception of a taste that is already present in the mouth. I can, for example, make food or drink taste sweeter by adding a pinkish- red color, but, as yet, I haven’t come across a way to do that while serving someone a glass of water. Turning water into wine—now that’s still a step too far, even for the gastrophysicist at the top of their game (though, if you remember, in the previous chapter, that was pretty much what the inventors of The Right Cup were promising to do)! Nevertheless, a food or beverage company might be able to increase perceived sweetness by up to __% by getting the color of their product, or the packaging in which it comes, just right. Every little counts, as they say. Our responses to color in food and drink aren’t fixed but change over time. For instance, a few decades ago, marketers and cultural commentators were telling anyone who’d listen that blue foods would never sell. Roll the clocks forward a few decades, though, and we now have cool blue Gatorade, Slush Puppy and the London Gin Company all successfully promoting blue drinks. A Spanish company even launched a blue wine in 2016. * Given the rarity of this color in nature, it is normally introduced solely as a marketing ploy to capture the attention of consumers by standing out on the store shelf. The problem often comes later, though, when people actually get to taste that eye-catching drink. Seeing a transparent blue color will put a certain idea in the consumer’s mind about the likely taste. And if the expectation doesn’t match up with the reality, the manufacturer may well have a problem on its hands. In fact, you would probably be surprised to learn how many companies have come looking for help over the years, when their consumer panels and focus groups tell them that their brands taste different, even though all that has changed is the color of the product or pack. For example, a mouthwash manufacturer told me that their orange variant didn’t taste as astringent to people as their regular blue variety, despite the formulation of the active ingredients staying the same. It makes no sense until you learn something about the rules of multisensory integration governing how the brain combines the senses. Here, I am thinking of “sensory dominance”—where the brain uses one sense to infer what is going on in the others. The impact of color depends on the food. In the context of meat and fish, blue causes a distinctively aversive response. In one of my favorite “evil” experiments—the sort of thing that ethics panels were surely brought in to put a stop to—a marketer by the name of Wheatley served a dinner of steak, chips and peas to a group of friends. At the start of the meal, the only thing that might have struck anyone as odd was how dim the lighting was. This manipulation was designed to help hide the food’s true color. For when the lights were turned up part-way through the meal, Wheatley’s guests suddenly realized that they had been tucking into a steak that was blue, chips that were green and peas that were bright red. A number of them apparently started to feel decidedly ill, with several heading straight for the bathroom! * This is such a bad idea that I am pretty sure it won’t still be around by the time you read this. Maybe those old marketers weren’t completely wrong after all. The drink is supposedly targeted at millennials who, so we are told, like brightly colored alcopops, etc. But I am really not sure that they will want to be seen drinking blue wine. Ironically, the Italian Futurists used to serve their guests blue wine to shock them. And to think that someone now believes it will sell! 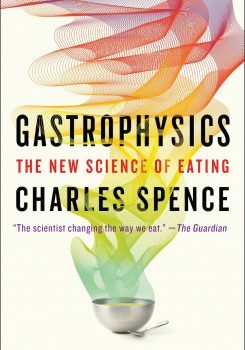 Excerpted from Gastrophysics: The New Science of Eating by Charles Spence, published on June 20th by Viking, an imprint of Penguin Publishing Group, a division of Penguin Random House LLC. Copyright © 2017 by Charles Spence. Charles Spence is head of the Crossmodal Research Laboratory and professor of experimental psychology at the University of Oxford in Oxford, England. From the plate color you pick to the dinner music you choose, you can enhance the flavor of your food without changing the recipe. The color of wine can prime your brain to expect a certain aroma and taste—a detail that's useful to both winemakers and psychologists.